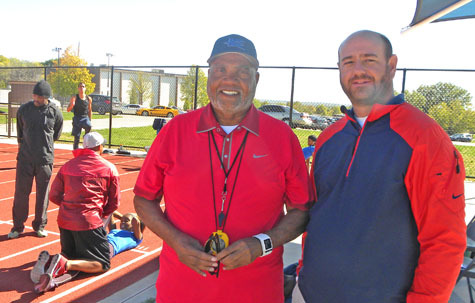 KCKCC trainer, track coach played role in success of Royals’ MVP Cain – Welcome to Wyandotte Daily! While the entire Royals fandom reveled in the success of Lorenzo Cain in helping the Kansas City Royals win the American League Division Playoff, it was even more significant for Rodney Christensen and Al Hobson. Following injury-plagued seasons of 2011 and 2012 in which he played a combined 67 games, Cain underwent three months of workouts under the direction of Christensen and Hobson at KCKCC and while it would be pure folly to suggest their rehabilitation was the main reason for his recent success, the facts are that he played in 133 regular season games this year, led the Royals in hitting with a .301average and was named the Most Valuable Player in the ALDS after hitting .533 and starring defensively. At the same time, Christensen referred Dr. Key and the Royals to Hobson, who has coached several Olympic sprinters, the most notable former Olympic 100 and 200-meter dash champion Maurice Greene. Coinicidentally, Dr. Key’s father-in-law was a teammate with Hobson at old Sumner High School. Hobson’s first step was to analyze the way Cain ran. He also worked with Cain to use strategic stretches to prevent injury and helped him get in “sprinter shape” with lunges and double leg bounds up and down steep hills near Wyandotte County Lake.